State-trace analysis is a non-parametric method that can identify the number of latent variables (dimensionality) required to explain the effect of two or more experimental factors on performance. 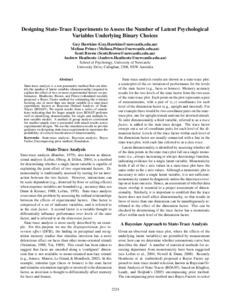 Heathcote, Brown & Prince (submitted) recently proposed a Bayes Factor method for estimating the evidence favoring one or more than one latent variable in a state-trace experiment, known as Bayesian Ordinal Analysis of State-Traces (BOAST). We report results from a series of simulations indicating that for larger sample sizes BOAST performs well in identifying dimensionality for single and multiple latent variable models. A method of group analysis convenient for smaller sample sizes is presented with mixed results across experimental designs. We use the simulation results to provide guidance on designing state-trace experiments to maximize the probability of correct classification of dimensionality.